"Hey, look at what WLIW has on its Auction site". That's how the trip began. WLIW, a local Public Television Station (UHF 21 out of Long Island, NY), doesn't do the "beg-a-thon" like so many other modern PBS stations. Instead, it auctions off various donations, and our England/Switzerland trip with BCT in 1999 was a previous example. It's a good way to support your local PBS station, as well as a chance to save some money. 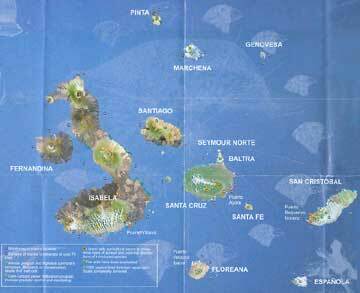 <!- spacer> <!- left box> The landscape of the Galapagos is an archipelago of small to medium sized islands, of volcanic origin, with the five volcano's of Isabella Island being the largest individual landmass. The first thing that strikes you is that the islands are not lush jungles. Everything is very dry and dusty - a virtual desert next to the sea. <!- spacer> <!- left box> A view from the west side of Santa Cruz <!- right box> The flora of each island tends to be subtly different, although they do follow certain trends: they're all quite arid and desert-like along the sea coast, with either cactus, "holy tree", or mangrove being the most common large plants. Reportedly, a good biologist can look at the plants on an island and tell you if certain species live there or not - - afterall, why grow spines, if there's no one around to eat you? 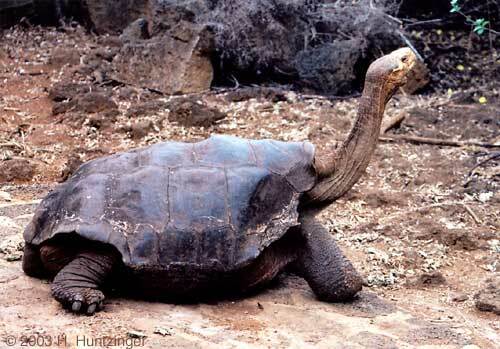 The location of the Galapagos Islands is roughly 600 miles due west of Ecuador, in the equatorial waters of the Eastern Pacific Ocean. 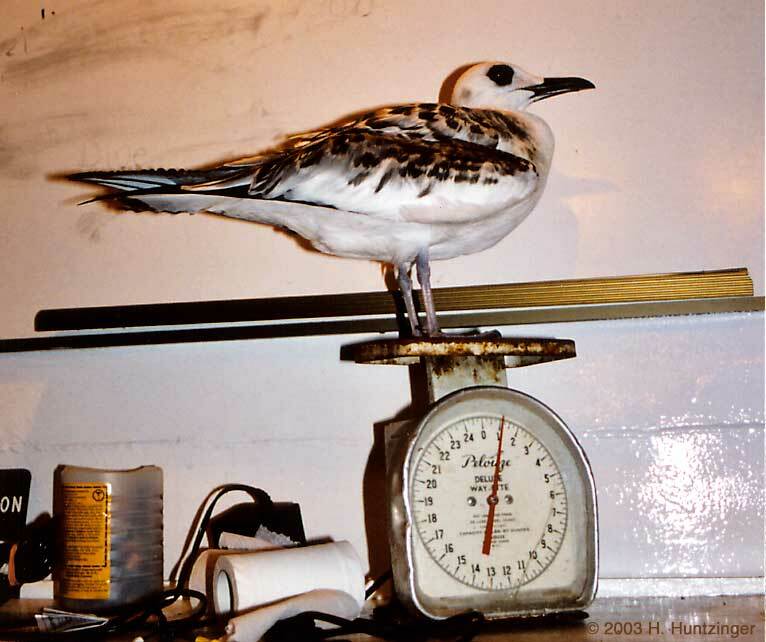 This biological isolation away from the mainland created the opportunity for the animals that made it here to evolve into some unusual niches, particularly your normal land-based animals who can't fly or swim across great distances. 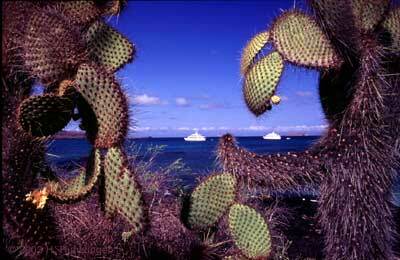 The Galapagos Islands are famous in part because of Charles Darwin. 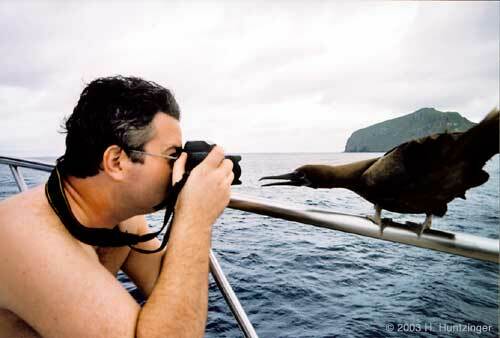 He visited here on the voyage of the HMS Beagle, and his studies of the endemic wildlife here later became the foundation for his Theory of Evolution. <!- spacer> <!- left box> Click the photo for a close-up of this Land Iguana <!- right box> The Galapagos Land Iguana's diet includes cactus and other succulents. 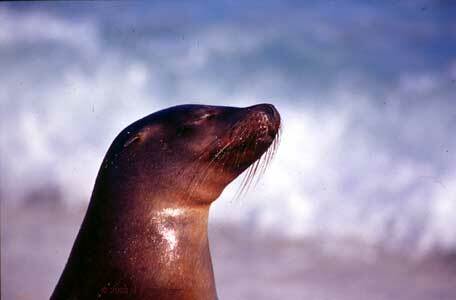 Their habitat is in the arid lowlands, which are hot and dry for most of the year. 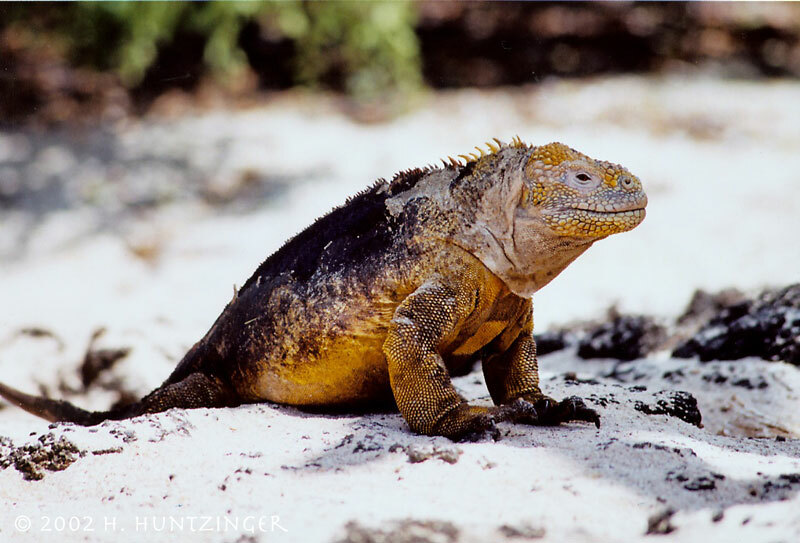 Today, the Land Iguana is having a rough time, due to invasive species introduced by man: their eggs get eaten by rats and fire ants, and stepped on by goats and mules, who also eat some of the more tender browse when its seasonally available. Man is now giving them a helping hand with captive breeding, and is also eradicating the invadors to restore habitat. 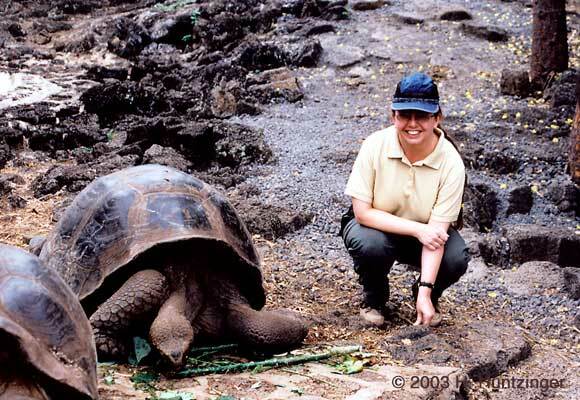 <!- spacer> <!- left box> The location of the Galapagos Islands is at the intersection of the warm Panama Current, the cool Humboldt Current and the upwelling cold Japanese Current, which together creates a rich Mixing Bowl of sea life. 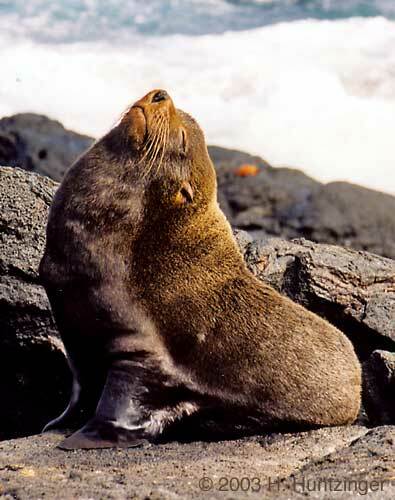 ... or the physically smaller and less numerous Fur Sea Lion (not "Fur Seal"). Both are found along many beaches stretches and rocky haul-out's, and it is sometimes amazing to see the tiny rock niches that they've climbed up to, over rugged rocks and ledges, and out of rough deep water drop-off's. 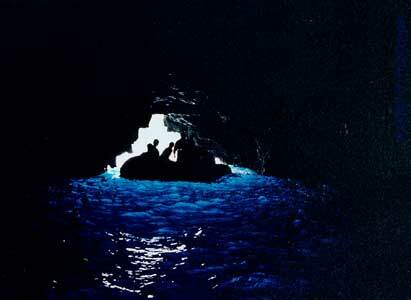 Seabirds frequent here too, and nest profusely. 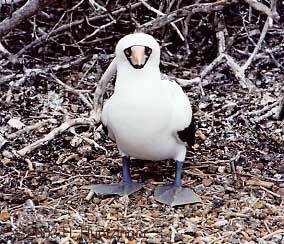 All over the world, it is common for seabirds to nest on islands, as these locations are generally more safe from most ground predators. <!- spacer> <!- left box> What's less common is for there to be such a great abundence of nesting habitat with plenty of food nearby. 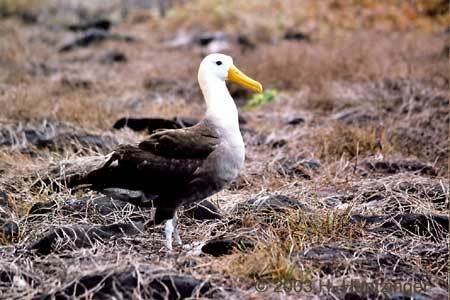 While the seabirds that the Galapagos are probably best known for their Boobies, present in smaller numbers are many other fascinating endemic species. 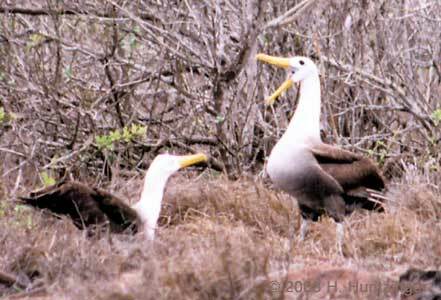 There's several Herons, a truly flightless cormorant, the Galapagos penguin, which is the world's second smallest and also the northernmost penguin species, and the Waved albatross, the world's second largest seabird. 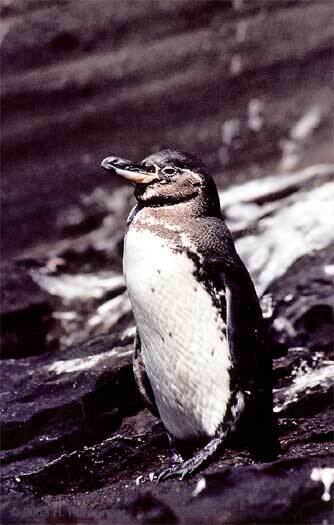 The Galapagos Penguin is perhaps a foot or so tall, and only resides in a few spots in the entire archipeligo. 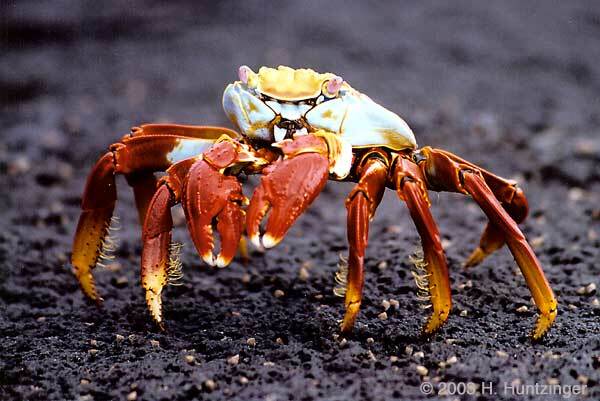 Their population crashed by ~80% from the 1997-98 El Niño, and currently only number around a thousand. Well, that's all for now. Hope you've enjoyed the pictures.